A new week and it's time to present this weeks "Record Of The Week". 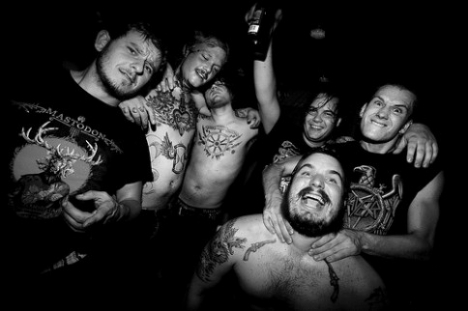 The six-piece punkrock band from Stavanger, Norway with the cool name "Kvelertak" The band formed in 2007. The group comprises vocalist Erlend Hjelvik, guitarists Vidar Landa, Bjarte Lund Rolland and Maciek Ofstad, bassist Marvin Nygaard and drummer Kjetil Gjermundrød. A band that is really frequented on this blog. Both the videos and live concerts where I have had the opportunity to photograph live, unfortunately, it was no such thing at the last visit. This weeks "Record Of The Week" is the second album and latest with Kvelertak that goes under the name "Meir" (Norwegian for "more"), was released in March 2013. It was recorded at GodCity Studios in Salem, Massachusetts, United States and produced by Kurt Ballou of Converge, the cover artwork was created by John Dyer Baizley of the band Baroness. 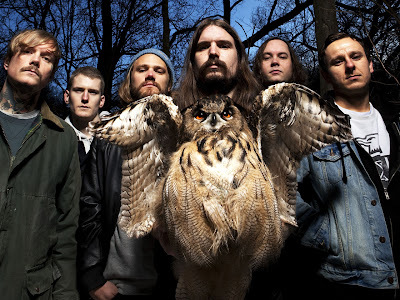 The band released music videos for "Bruane Brenn" and "Månelyst" and the self-titled song "Kvelertak". "Meir" has a bouncy punk kinda vibe and the album compares ok with the previous one. It filled of very traditional basic song structures and catchy rhythms, more accessible and it's fun and energetic. It's hard to compete with their previous, considering how much I liked their self-titled album. But the "Meir" has a really high class and grows certainly over time. Riffs in the tunes "Spring Fra Livet", "Åpenbaring, "Evig Vandrar," and "Månelyst" among others are sure to keep the listener in the mood and maybe invites you to dance. I definitely look forward to see what this band will come up with in the future and it will be incredibly exciting when the time comes to record number 3. One thing is for sure, if you like this band on record, you must experience this band LIVE! It's an energy boost like no other! 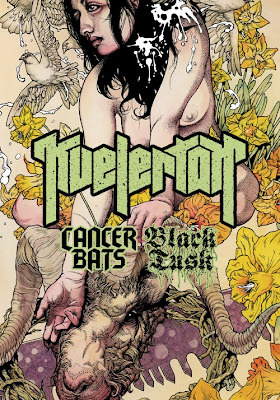 Todays tune is the final track, entitled, yes, "Kvelertak" which is a timeless beer-hoister. Enjoy! The video for the single are directed by Stian Andersen, edited by Erik Treimann. Filmed in March/April 2013 in London, Paris, Cologne and Oslo. Kvelertak US tour dates with a bunch of rad dudes called Cancer Bats and Black Tusk! Holy Shizznit that’s a fucked up lineup!!! Other Posts with Kvelertak on Tune Of The Day! Listen to ”Kvelertak - Kvelertak" on Spotify here! Detta ser man ju fram i mot, ska bli spännande att få höra.